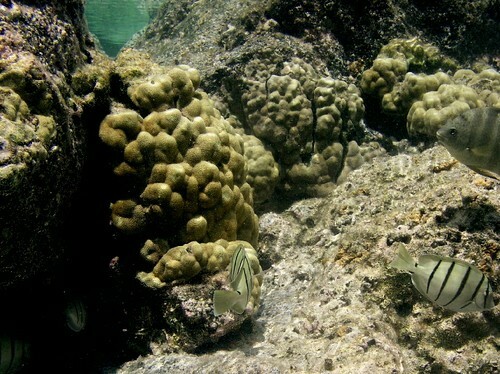 Porites coral colonies are very common in waters along the Kailua-Kona, Hawaii coast. Hobbyists tend to think of corals as having homogenous rates of photosynthesis, as witnessed by categorical statements such as “SPS corals need a lot of light.” These sorts of comments are generally based on tried and true observations, and are often valid. They have led the hobby to many successes. As our understanding of corals gains breadth and depth, we begin to recognize the details of those animals we maintain in captivity. These finer points lend clues to ultimately solving some of the remaining puzzles of maintaining corals in artificial environments. This article will present information concerning variable rates of photosynthesis across the surface of a small Lobe Coral (tentatively identified as Porites lobata) and offer discussion of the implications. Corals were legally collected (under permit by the Hawaii DAR) from the Puako area of the Big Island of Hawaii. A modified 25mm core bit removed plugs from Porites colonies (See Figure 1), which were ultimately used in experiments determining competitiveness of corals and turf algae. A few ‘plugs’ (maintained as ‘reserves’ for the main experiment) were held within a 100-gallon RubberMaid trough at the Natural Energy Laboratory of Hawaii (NELHA) in Kailua-Kona, Hawaii. Water chemistry and temperature stability are of little concern, since natural, running seawater is available for constant flow-through. These coral plugs were exposed to maximum amounts of unfiltered sunlight, and light intensity at the coral colonies peaked at ~2,000 µmol·m2·sec (~100,000 lux) at noon on cloudless days. These colonies were allowed to photoacclimate for several weeks before this experiment began. Figure 1: The Porites ‘plug’ used in the experiment. After acclimation, several coral samples were transported to a darkened, air-conditioned laboratory. A coral specimen was then transferred to a 38-liter aquarium filled with natural seawater. A small air pump provided aeration and water motion. A pulsed amplitude modulation (PAM) Chlorophyll Fluorometer (PAM-210, Heinz Walz GmbH, Effeltrich, Germany) was used to measure chlorophyll fluorescence and ultimately calculated Photosynthetic Yield, which was used to estimate Relative Electron Transport Rates within zooxanthellae photosystems. The 1.5mm fiber optic sensor of the fluorometer delivered actinic light (pre-programmed at an intensity of 391 µmol·m2·sec) to the zooxanthellae in order to stimulate photosynthesis; this probe also gathered and provided chlorophyll fluorescence data to a microprocessor that calculated Photosynthetic Yields. The fiber optic sensor was held at an approximate angle of 60º in relationship to the coral surface and Yield measurements were taken every ~2mm, for a total of 41 measurements. Relative Electron Transport Rates (rETR) were calculated using the formula: rETR=Photosynthetic Yield X PAR (µmol·m2·sec), which is appropriate for corals (Ralph et. al., 2002). Results were entered into an Excel worksheet and rETR was charted. The results demonstrate that rates of photosynthesis can substantially differ across fine scales of surface area (See Figure 2). 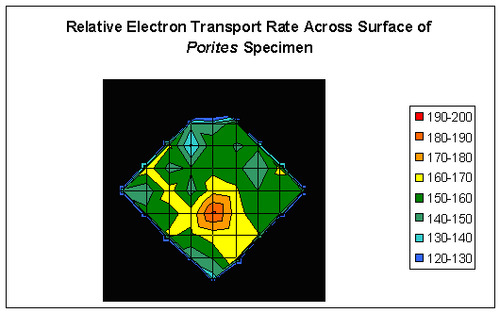 Figure 2: Relative Electron Transport Rate across the surface of the coral shown in Figure 1. The units in the legend are µmol·electrons·m2·sec which indicate flow of electrons from Photosystems II to Photosystems I within the symbiotic zooxanthellae. Rates of photosynthesis are not homogenous across the surface area of even small coral colonies. Although the chart is rather crude, there are clearly ‘hot spots’ of photosynthetic activity. We see variations in rETR of ~33%, even after photo-adaptation of zooxanthellae to high intensity sunlight. At least some coral species have profoundly different rates of photosynthesis in polyp tissues and the coenosarc (connecting tissue between the polyps) – see Ralph et. al., 2002. This is likely not the cause of variations observed during this experiment. Measurements of Yield proceeded after a dark-adaptation period of 20 minutes, and the coral polyps remained retracted during the procedure. Surface geometry affected the measurements. This is unlikely, since this small specimen was relatively flat, and results were replicable. 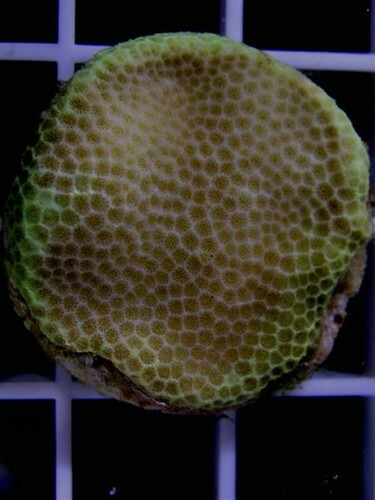 Concentrations of zooxanthellae can vary across a corals surface. We were not able to check this, although microscopic exams of other corals sometimes show variations in numbers of zooxanthellae over surface area. In a similar vein, it is possible that different zooxanthellae ‘clades’ or species, possessing different photosynthetic capabilities, inhabit coral surface areas at fine scales. Water motion affected the rate of photosynthesis. The importance of water motion should not be ignored, however, results from previous experiments suggest minimal water motion can disrupt areas of stagnant water (by thinning of the boundary layer) and allow diffusion of nutrients and micro-nutrients required for photosynthesis, thus making this theory unlikely. However, we cannot completely rule out the possibility that micro-areas of stagnation did limit photosynthesis. See Kolber et. al., 1998 for further details. The exact reason(s) for variations of photosynthetic rates remains a mystery, but the results obviously suggest differing rates of activity even in small colonies. One has to wonder how the rates vary over an entire adult colony of Porites lobata (which can be meters in diameter and have many light- and dark- adapted areas). Although bleaching of this colony was not observed, it is possible that, under different circumstances, loss of symbiotic algae or photopigments could occur locally. This could explain some observations of ‘spotty’ or ‘mottled’ bleaching patterns often reported by hobbyists. This possibility will be investigated. Note: There is some green fluorescence, generally around the perimeter, of the ‘plug’ colony shown in Figure 1. Attempts were to establish enhanced or reduced rates of photosynthesis within this pigmented area did not meet with success, and no link between coral tissue fluorescence and zooxanthellae chlorophyll fluorescence could be established. This method of gathering and plotting data, although rather crude, does offer a relatively inexpensive alternative to expensive fluorometers with the ability of plotting fluorescence over area. With use of the PAM-210’s fiber optic cable, it would be possible (given enough patience) to record and chart the relative electron transport rate of every polyp on a coral’s surface. In summary, the results and implications of this experiment suggest photosynthesis is heterogeneous across the surface of a coral, even in one exposed, and allowed to photoacclimate, to high intensity light. As such, differing rates of photosynthesis is not limited to just illuminated and non-illuminated areas (as seen with shaded areas). Also, no photoprotective link is established between green fluorescence and rates of photosynthesis via PAM fluorometry (see Mazel, et al., 2003) for comments about green fluorescence and its impact on zooxanthellae photosynthesis. Kolber, Z., O. Prasil and P. Falkowski, 2000. Measurements of variable chlorophyll fluorescence using fast repetition rate techniques: Defining methodology and experimental protocols. Biochim. Biophys. Acta., 13 (67): 88-106. Ralph, P.J., R. Gademann, A.W.D. Larkum and M. Kühl, 2002. Spatial heterogeneity in active chlorophyll fluorescence and PSII activity of coral tissues. Marine Biology, 141: 639-646.